I opened up my blog admin page today to see what I could see, thinking maybe I’d write a post about the Cosmic Tripster party I went to last week or all the flowers that have bloomed since I began house-sitting in Portland a week and a half ago or what we see when Isabelle the Pug and I walk around the block. But instead, I was greeted with a cryptic message that said I needed something called an API key in order to continue having the Google map I use on my main page to show where I am at any given moment. So I began clicking through on the active links, trying to figure out just what it is that I needed to do, and after I had about 6 new pages open, I still had no idea what I was supposed to be doing. 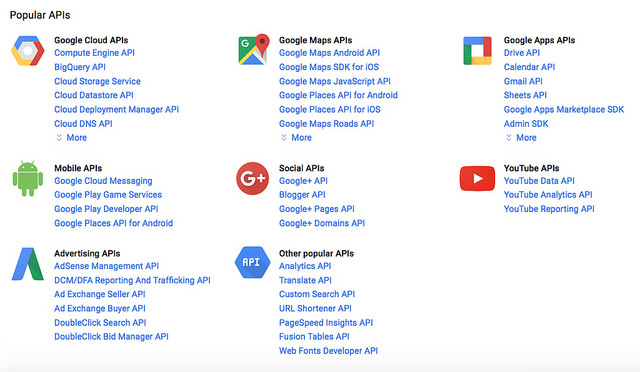 The first page I’d opened had a list of “popular” API key links (yep, that’s what it says – “popular APIs”), including sixteen of them just for the Google Maps. Really? Sixteen different APIs? How was I supposed to know which one I needed? One of the other pages I opened was called a Credentials page where I had to create my credentials, whatever they are. Another page said “If your client application does not use OAuth 2.0, then it must include an API key when it calls an API that’s enabled within a Google Cloud Platform project.” I think that entire sentence is written in Greek or something. No, wait. It’s written in Geek 2.0. Haha! Weird things like that greeted me on just about every page. So when I read this: “If you’re unsure whether an API key is appropriate for the API you’re calling, select Help me choose and follow the instructions to pick the right credentials.” I thought I was finally headed the right direction. But guess what? I couldn’t find the Help me choose link! Gah! One of the pages said I had to choose the type of API key I wanted: Server key? Browser key? iOS key Android key? How am I supposed to know? I don’t even know what an API key is! I went back to the page with the sixteen links for the Google Maps API keys and clicked on a few, trying to figure out which one I needed. I finally just picked one that had a description that sounded like it might be the right one: “Place an interactive map or Street View panorama on your site with a simple HTTP request using the Google Maps Embed API. Set the Embed API URL as the src attribute of an iframe to easily embed the map in your webpage or blog.” Again, of course, most of that description is written in Geek 2.0 but I thought I’d go ahead and try it anyway. What did I have to lose? I started typing stuff into the empty boxes where it had nice descriptive things like example written in a blank space (really? example of what?) and then I clicked on the okay button. And guess what! A box with a long list of digits popped up! I copied and pasted those digits into the box in the blog admin area and it worked! The alert on the admin page disappeared! And when I checked my blog page, there was a map! Yay! But before I was ready to leave that admin page, there was one last hurdle: it said I had not created any kind of security for my API key and anyone who wanted to could use it. I’m guessing those are people who know what API keys are and what they’re used for because I still don’t have a clue. Did I want to lock people out from using this API key? I think so. It sounds like something I should do, doesn’t it? But I’m not sure. So I erred on the side of caution, and created some security for my API key. Now I’m the only one who can use it. Sometimes I feel like such a dinosaur when it comes to technology; there was a time when I thought I was keeping up but that was many years ago. Many many years ago. Now I just feel like a T-rex who’s time-traveled to the present day and is wondering what a car is. I’m so lost when I’m trying to navigate through something like these API keys. Lost. I hope I never have to do this again because I have no idea what I actually did to get all those digits, that API key, and I have no idea what I did to create the credentials. I hope I never have to re-create any of this. However, if I check the main page of the blog, the map is still there and it still says where I am. That’s all I want it to do. 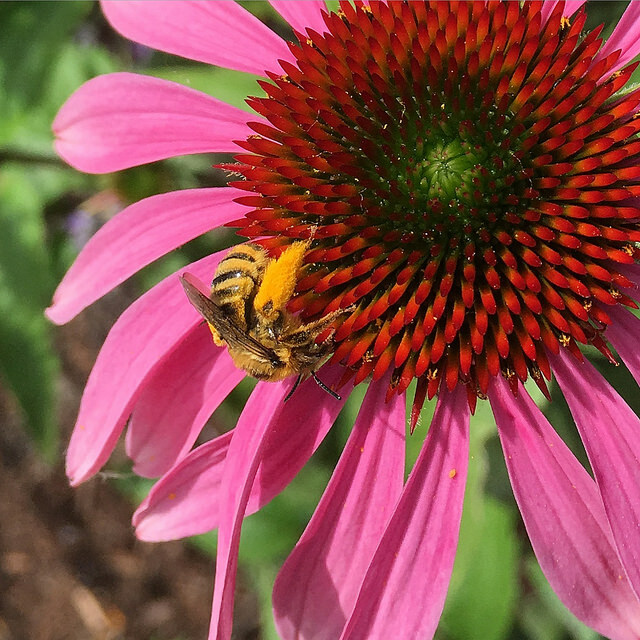 And now, I hope you enjoy the photo below of the pink echinacea with the pollen-loaded bee – it’s out in the front yard. Here’s to the dinosaurs! Long may they live! Lois June 24, 2016 June 25, 2016 Now What? Are you sure it wasn’t a virus. Hate to tell you this but I see no map! But it sounds like something this dinosaur in the UK would also get lost fiddling with too. We dinosaurs need to stick together! Rock on! Well, aren’t you the computer wiz. Here I am this morning and YES, I have a working map! Seriously, do your talents never end?….. Glad to hear your health is improving and we may be travelling along with you again real soon. Good morning from this side of the pond! I love Google! I think I could find out anything I ever wanted to know from there. I’m sure that the cruising around I did in my searches at least helped me figure out if I wanted the embed API key or the Android API key or if I wanted a browser key set up in the project of my choice. I didn’t realize that my blog was what they were calling my “project” and I never would have called myself a Google Developer, but both of those are things I had or was doing, unbeknownst to me. Live and learn! From my geek days: API aka Application Program (or Protocol) Interface – in TCP/IP speak, it’s the internet protocol LAYER between GOOGLE and the Application. Oh yeah . . . and TCP/IP: Transmission Control Protocol/Internet Protocol. Just sayin’ . . . I don’t hate you, Nancy! Every bit of info is a good bit because it adds to the whole!